Len'en Tasouken ~ Earthen Miraculous Sword (鏈縁 蛇叢釼 〜 Earthen Miraculous Sword, lit. "Connecting Chain of the Snake Thicket Sword") is the second game in the Len'en Project made by JynX, the only member of Trick Nostalgie. 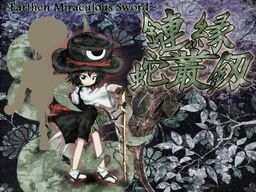 As a Len'en game, it features completely new characters and locations separate from the Touhou Project. The game was produced concurrently with Evanescent Existence. The trial version was released on September 12, followed by the full version on November 18, 2013. The game has three playable characters, a story mode with 6 stages and an Extra Mode with selectable difficulty – Easy Extra Mode and Extra Mode which can be unlocked by clearing the main game on any difficulty, as well as Absurdly Extra Mode which is only unlocked once the main game is cleared on Unreal difficulty. The main new gameplay mechanic involves grazing to fill a meter which will allow the player to use a special bomb known as a "flash bomb". Pressing the bomb button while unfocused will release a flash bomb if the meter is full, otherwise it won't do anything. There is also another mechanic called the "cloud flower gauge", which is represented by a five-petaled flower on the bottom-right of the screen. It fills up by defeating enemies and capturing spell cards, but it depletes when the player dies or bombs. The higher it is, the greater point multiplier will be awarded, and if you finish the game with it full, something special may happen. The weather in Mugenri became exceptionally cloudy. It's up to Yabusame, Tsubakura, or Kuroji to find the perpetrator and solve the incident. The game features original tracks composed by JynX. This page was last edited on 29 June 2015, at 20:35.